Hi everyone! 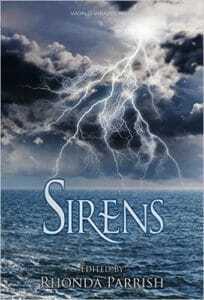 A couple of weeks ago I told you to preorder Rhonda Parrish’s newest anthology Sirens. Today I’m hosting a guest post from one of the authors in the anthology. Tamsin Showbrook wrote “Siren’s Odyssey,” one of my favorites from the book. She’s here today to talk about her writing process. So without further ado, here’s Tamsin Showbrook! It’s great when there’s a submissions call and you already have an idea which works with the theme. The world in which Siren’s Odyssey is set was fully formed in my head, because for a few years now I’ve been working on a young / new adult novel series called Strandline, involving amphibious humans. The inspiration for Siren’s Odyssey came from several sources. 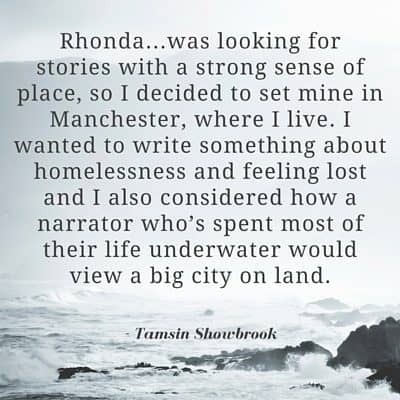 Rhonda Parrish (the anthology editor) had said that she was looking for stories with a strong sense of place, so I decided to set mine in Manchester, where I live. I wanted to write something about homelessness and feeling lost and I also considered how a narrator who’s spent most of their life underwater would view a big city on land. Manchester is truly inspiring in terms of history, architecture and the arts, but there are – as there are everywhere – social issues that shouldn’t be ignored and people who need help and understanding to get their lives back on track. The legend of siren-song, as featured in Homer’s Odyssey in particular, is the starting point for the action in the story, and there are some cheeky James Joyce Ulysses references in there too. I decided to have some fun with structure and form (though ask anyone who knows me and they’ll tell you I have a twisted notion of “fun”) so I plumped for having two narrators. It means the reader gets a mix of perspectives as events unfold. Aahleis and Hannah come from very different places and speak in very different voices – Aahleis is quite formal; Hannah is… less so – but they’re linked by circumstances and details in their past lives. The story is a journey of discovery for them both. Someone told me I’m a “discovery writer” – which means I let ideas spill out of my brain at great speed and then backtrack and sort everything out. It’s kind of like putting up a tent really fast because you know what a tent should look like, but the first attempt has all the tentish elements, just not necessarily in the most effective order. You have a horrible night’s sleep under a wrinkled heap of sticks and canvas, but get up in the morning knowing you can fix that, and you just get on with it. Probably more work overall, but it’s the way I function. Writing for a living is currently a fond dream, so the organisational part of me has to be focused on other things. Research is a continuous process, rather than just something I do before beginning to write. Things get jotted down and I have notebooks and odd pieces of paper floating around everywhere. I envy people who can call up facts and figures without it involving a smartphone or having the source material in front of them; my brain is a constant source of frustration to me. Where SFF is concerned, my preference in reading as well as writing is for reality with a twist. I’m not a fan of battle scenes where armies run at each other really bloody fast until there’s yet another break for a long family history or back story. Superhero stuff’s great and I like a spaceship or two thrown into the mix at times. The human struggle is always the most important factor for me though. At the moment, I’m reading the amazing Kindred by Octavia E. Butler. I’m also re-reading the Harry Potter books with my eldest child, who’s seven. It’s so cool seeing his eyes light up every time. He often sneaks an extra read by himself after he’s supposed to have gone to sleep, which brings back happy memories of doing the same thing at that age. The world of Siren’s Odyssey is almost identical to our own now, on the surface. Amphibious humans have kept themselves hidden from us, but interacted / interfered in subtle ways. With the way things have gone in our recent history though – especially with regard to the environment – certain factions are ready to go to war with each other and us. Strandline explores these ideas in much more depth, although the action there starts in a fictional town called Learmouth on the Yorkshire coast and features different characters. Aahleis and Hannah don’t appear in the series at all. Yet, anyway. They might get cameos at some point. Currently, I’m working on lots of different stuff. My short story and flash fiction writing is going well, I’m roughly 20k words into a slipstream novel set in Lincolnshire and of course I keep revising / submitting the first book in the Strandline series. Please do get in touch via Twitter: @TShowbrook, or via tamsin.showbrook@gmail.com if you’ve any questions or comments, or if you just fancy a chat over a virtual cuppa. Stephanie again–And in the meantime, don’t forget to order Sirens, which released two days ago! guest posts, Rhonda Parrish's Magical Menageries, writing process. Bookmark.